Pot Pie is amazing. I am really having a hard time thinking of something that is better. It is delicious, adults love it, kids love it. You can make it ahead and freeze it for a super easy meal later. You can pack it full of veggies and kids will eat them right up. It is a total comfort food and after you eat it you just feel satisfied and happy. Oh and the leftovers are really delicious. 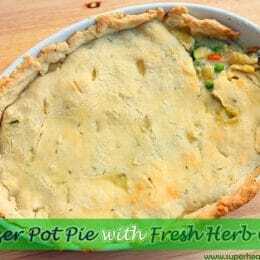 This Freezer Pot Pie Recipe is especially delicious because I used fresh rosemary in the crust. 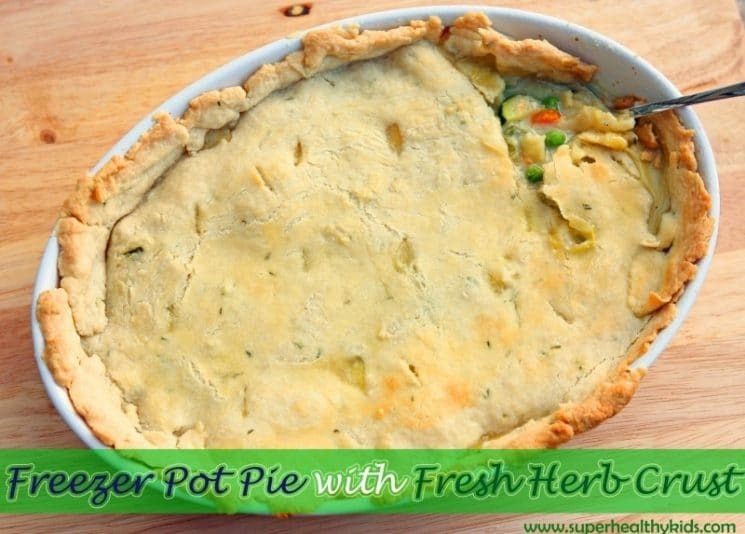 It deepens the flavor of the entire pot pie and adds a delicious savory flavor. Let’s begin with the crust. 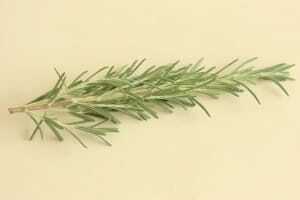 I cut a sprig of Rosemary about 3-4 inches long, and used about 3/4 of it. The amount you use will really depend on how much of that flavor you want. You can really use just about any fresh herb for this. Rosemary has a fairly strong flavor and if your kids aren’t used to it, you may want to use a little less. I made this crust in my food processor which was the best and easiest thing I have ever done! Combine the flour, salt and sugar and pulse until well combine. Then add your herbs and pulse a food more times. Add the butter and pulse 6-8 times until the mixture looks like little pebbles. Next you will add ice water 1 tablespoon at a time. Add water just until the mixture begins to combine. 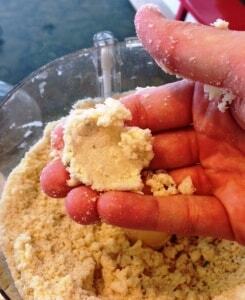 It will still look crumbly, but if you can press the dough together like the picture below it is ready. If you add too much water, it will be too sticky and the crust will be tough. 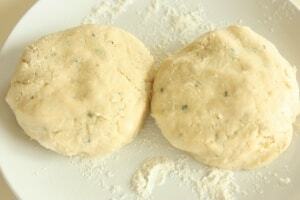 Place dough onto a flour surface and divide in half. Place on a plate, cover with plastic wrap and then put in your fridge while you make the filling. To make the filling, begin by chopping your veggies. The great thing about pot pie is that you can include or not include whatever veggies you want. I used carrots, celery, potatoes, and onions. I had some fresh green beans from my garden and so I also added those. I also had some baby zucchini and so I chopped those up and added those (zucchini cooks faster than other veggies and so I waited to add it until towards the end of cooking) I also had some frozen peas in my freezer and so I added those towards the end. Our pot pie was literally packed with veggies! 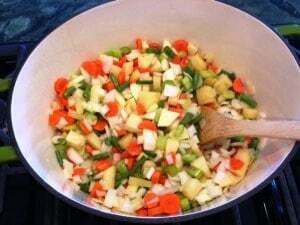 Saute the veggies in olive oil until they begin to soften. Next add your pre-cooked chicken. You can use leftover chicken, or cook some up just for this. Sprinkle it with flour and stir it all around until combined. 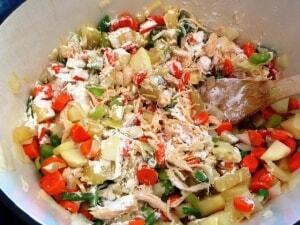 Then you will slowly add your chicken broth and seasonings and let it cook until thickened, about 3-5 minutes. Then add your milk and simmer for a a minute or so more. 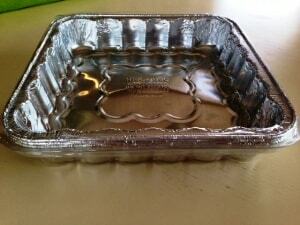 When you are going to put a one-pot dish in the freezer, I love these foil pans. This way you aren’t using one of your dishes, and you can throw this away when you are done. Pour your filling into your container, and let it sit for a few minutes to cool down a bit. This recipe is great because it makes 2! One for dinner that night and one to freeze for later. While your filling is cooling down, get your crusts out from the fridge and roll out onto a floured surface. Place the crust over your filling. You can do the edges however you want, but I didn’t want the time to make it fancy and so I just folded them in a bit. 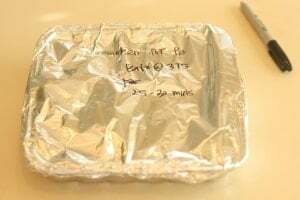 Cover in foil and write the directions on the top. When you are ready to bake a frozen pie, get it out of the freezer 30 minutes before. Preheat your oven to 425 degrees and bake covered for 20 minutes. Reduce heat to 375 degrees F and bake for an additional 30-40 minutes or until the top is golden brown and the filling is bubbly. Then grab a big spoon and dish it up to your hungry family. 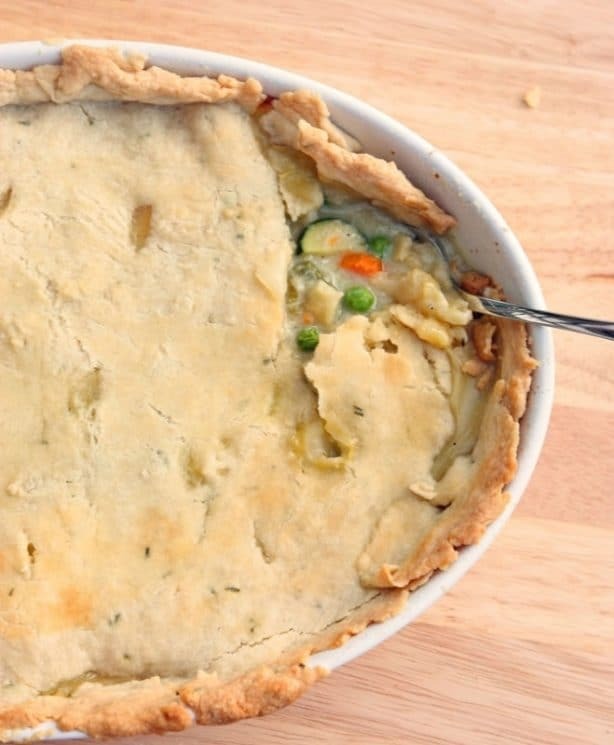 This savory pot pie is sure to be a crowd pleaser! Combine flour, salt, and sugar in a food processor; pulse to mix. Add rosemary and pulse a few more times. 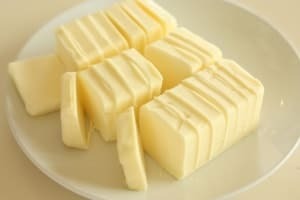 Add butter and pulse 6 to 8 times, until mixture resembles small pebbles. Add water 1 Tbsp at a time, pulsing until mixture just begins to clump together. If you pinch some of the crumbly dough and it holds together, it’s ready. If the dough doesn’t hold together, add a little more water and pulse again. Too much water will make the crust tough and too sticky to work with. 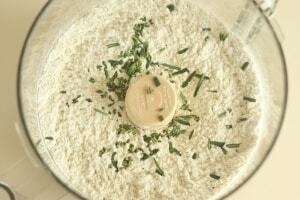 Remove dough from machine and place in a mound on a clean surface. Split the dough into 2 and form into a ‘disk’ shape. Sprinkle flour on a plate, wrap each disk in plastic wrap and refrigerate while you are making your pie filling. When you are ready to roll it out, let the dough sit at room temperature for 5-10 minutes in order to soften just enough to make rolling out a bit easier. Roll out with a rolling pin on a lightly floured surface to As you roll out the dough, check if the dough is sticking to the surface below. If necessary, add a few sprinkles of flour under the dough to keep the dough from sticking. Place on top of your pie. Dice your veggies and saute in olive oil until softened. Add your chicken and sprinkle with flour, mix together. Pour chicken broth over top and stir. Add salt and pepper to taste and dried thyme. Simmer together for 3-5 minutes until thickened. Add milk and simmer for a minute more. Pour filling into your baking dish. This will make enough filling for 2 pot pies. To Bake: Bake at 375 degrees for 30-40 minutes or until the top is golden brown. 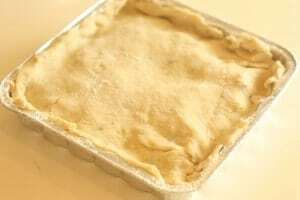 Baking from Frozen: Get your pie out of the freezer 30 minutes before you are ready to bake. Preheat your oven to 425 degrees and bake covered for 20 minutes. Reduce heat to 375 degrees F and bake for an additional 30-40 minutes or until the top is golden brown and the filling is bubbly. I am looking forward to it! I have it in the oven but I had to pull the recipe because the cooking instructions weren’t on the printed recipe : ) I also cheated and used crushed crackers with some soy butter for the crust since I didn’t feel like rolling out the dough. Oh the life! Thank you for so many great ideas, recipes and tips. This sounds amazing and I’m super excited to make it! I’m wondering how big the baking dishes are you are using? They look bigger than a square pan but smaller than a 9×13? This looks amazing!! I make a delicious homemade pot pie almost like this. But I always cheat and use a premade crust. Definitely going to try this one out. Especially love the fact that this is freezer friendly. This is my 6 year olds favorite meal! Yes! It turns out delicious. love love love your recipes. Could I use whole wheat or spelt flour? If I use 8×8 pans do you think I could get three out of this recipe or should I do a recipe and a half? Loved that it made 2 pot pies. We ate one and put the other in the freezer. I swapped chickpeas and veggie broth for the chicken and it was delicious! We started making this years ago and kinda lost track of the recipe. Made it again tonight & remembered just how yummy it is. Parent and kid approved, was gone in minutes!! We’ll add it back into our dinner rotation!